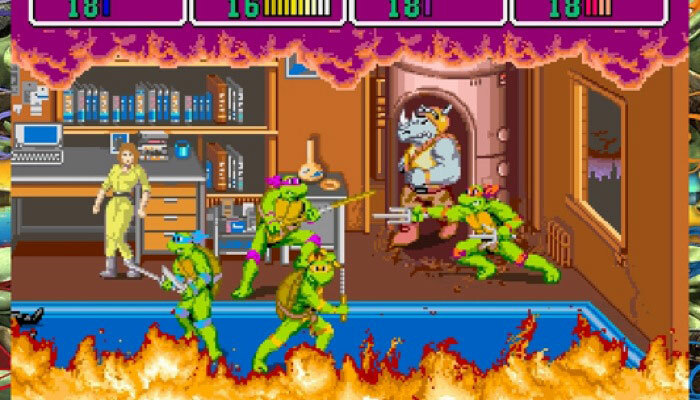 Teenage Mutant Ninja Turtles IV - Turtles in Time is often described as the best beat em up on the 16 bit platforms. It has a cult following, almost as large as the franchise which spawned it and has recently been remade for the Xbox 360 and PS3 generation. I've been a fan of this game since I popped it into my SNES over 16 years ago and I want to explain why. Growing up, the beat em genre featured highly in most of my favourite arcade memories. At the local arcade, the two prime cabinets that always had hordes of kids pressing around them were the X-Men and The Turtles. I spent most of my time at the Turtles arcade cabinet, enjoying the attract cries of Cowabunga and the visually appealing attract mode. This was just like playing an episode of the cartoon, with appearances by Krang, Baxter Stockman and of course Shredder - I was in turtle heaven. The amazing TMNT Arcade game in all it's glory! A short time later various conversions for the original arcade game appeared for the home systems, while good, these didn't quite capture the appeal of the arcade original. 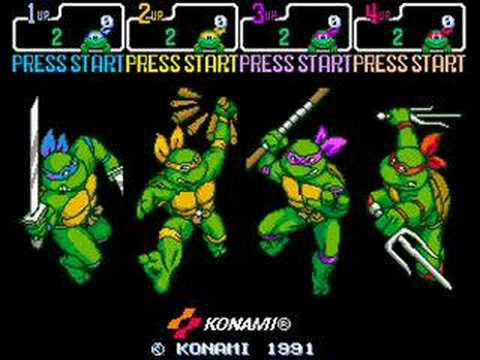 Until in 1992 Konami released a Turtles beat em up which not only equalled by surpassed the arcade experience. 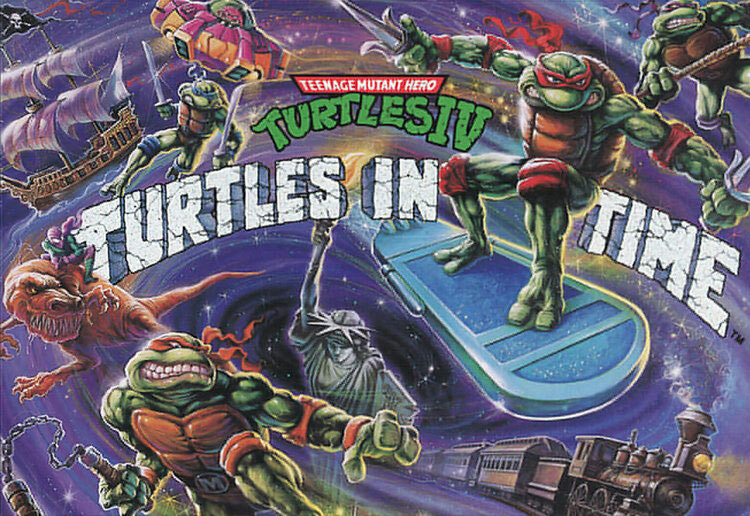 The side scrolling beat-em up genre is perfect for the Turtles franchise. Enabling players to select their favourite turtle and kick some shell across the screen, with co-op action and battling through time and space. This title was sure to be a success. 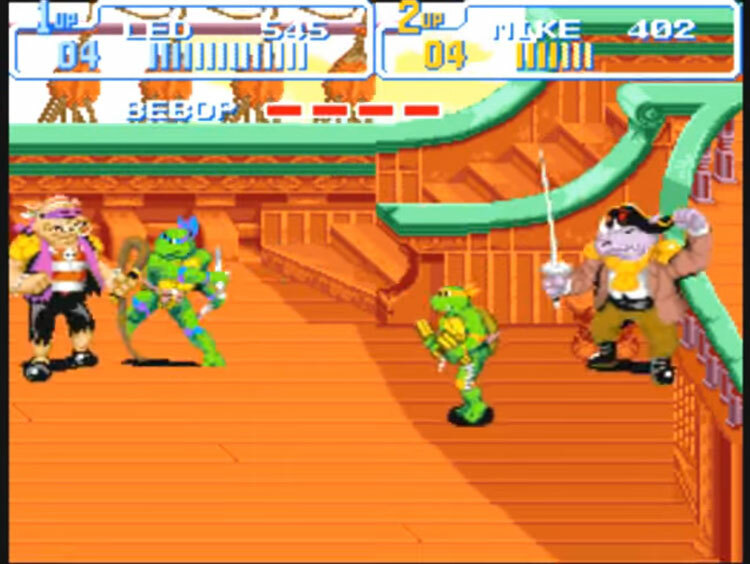 Turtles in Time was originally developed for the arcades but when it was ported to the SNES, the conversion featured additional levels and boss battles. The story is a familiar affair for most turtles fans. Krang steals the Statue of Liberty and the fantastic mutant foursome must rescue it. Through the initial levels, the Turtles battle the footclan across the streets of New York City, down into the home territory of the sewers and eventually to the Technodrome. After defeating two bosses from the TMNT 2: Secret of the Ooze film (Tokka and Rahzar) you then tackle Shredder. This boss fight is one of the most innovative in video game history. Playing out as a enemy POV similar to the first boss in Battletoads, you must throw enemy foot solders towards Shredder - cracking his screen and avoiding his attacks. I remember reaching this stage and thinking how cool it was to have fought bad guys from the films and I marvelled at the Shredder boss battle (once I worked out what I had to do to defeat him!). But thinking that the game was a bit short, Shredder was obviously the final boss, defeat him and the game would end...wouldn't it? No, in a twist of genius, just when you thought the game was over, you are caught in a time vortex and must fight your way through time to get to the final boss fight with Krang and Shredder. I was genuinely shocked and pleased at this turn of events. Konami had crafted unexpected longevity in a game where they could have created four levels and milked the money from the fans. They chose not to, they chose to develop an absolute masterpiece of level design and a game which screamed FUN - all in capital letters at the players. 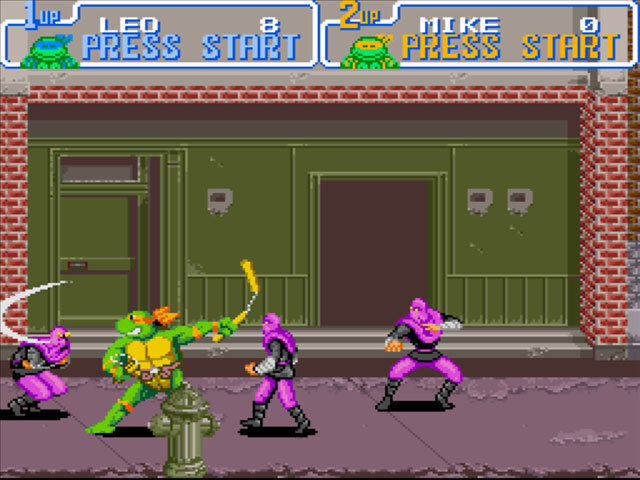 Similar to TMNT 3 on the NES, choosing your character dictated the style of gameplay you would experience. Donatello has the largest reach, while Raphael has the highest attack speed but the lowest defence. Leonardo is a good all-rounder but Michelangelo, with his fast as lightening nunchucks was my favourite. Each Turtle possesses a unique combo attack, but unlike TMNT 3 - no energy is drained while using it. Turtles in Time features a wide variety of attacks, including multiple jump kicks and grabs. One grab enabled the player to throw a foot solider over their head and swing them back and forth, destroying any enemies in the way. 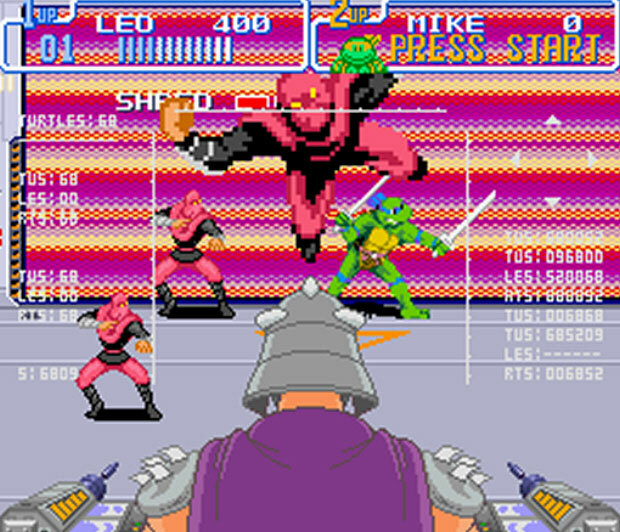 This expanded move set enabled the player to experience a variety of methods to attack in a way that previous games in the Turtles franchise didn't. The items in the levels were highly interactive, attacking the fire hydrants and traffic that then serve as handy, devastating projectiles. Objects to avoid like the giant wrecking balls. open manhole covers and loose planks making for great hazards. Interacting with those hazards, rather than being annoying, actually made me smile. The animations of falling down a manhole cover, your character's body dropping, leaving two eyes which quickly followed the body, brought cartoon quality humour into the game. The levels are incredibly varied, we start with the traditional streets and sewers, but in later levels, the developers bring us speeding trains, pirate ships and a fantastic F-Zero hoverboard style level. Superb use of Mode 7 on display in this level! The boss battles really stand out in my mind, the variety of the characters and stretching the source material, not just from the TV show, but also bringing them from the Films and comics. 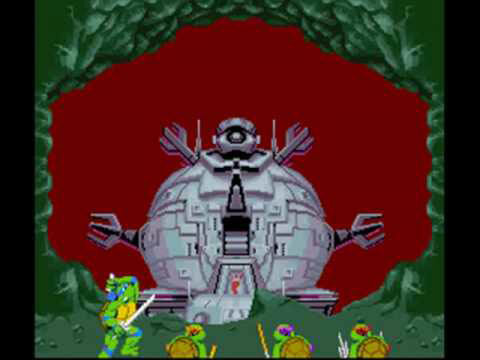 The SNES version featured additional bosses such as The Rat King, Slash, Bebop and Rocksteady and the last boss was TMNT 2's Super Shredder. These fights were never cheap and actually were pretty easy, but the inclusion of these characters made the game so very satisfying. It was nice to see my favourite villain - Baxter Stockman in Fly form present here. But it was the Pirate versions of Bebop and Rocksteady which captured my heart! The Boss designs were imaginative and fun to play through. Turtles in Time is one of those titles that is always mentioned in a tone of excited awe amongst gamers. This was a time when Konami was at the top of their game and took the effort to best their arcade original in the SNES version. Going back and playing this, brings back memories of how much fun these 90's beat em ups were - especially in co-op mode. This is without a doubt one of the best games ever made.